In setting out to ask whether the gender power balance can be redressed in India, writer Sharmila Chauhan creates a commune – Shaktipur – not all that dissimilar from some remote areas of the country, in which the scarcity of women means that they can and do take multiple husbands. However, where women are still subjugated in these polyandrous communities, they are venerated in Shaktipur, led by Aya (Syreeta Jumar) – a woman who has pioneered new methods of agriculture and brought renewed prosperity to the region. Aya’s power over her two husbands Sem (Rhik Samadder) and Omar (Mark Theodore) is absolute, as she prepares for her third marriage to a wealthy landowner with property in Mumbai, which she seeks to use to expand the teachings of Shaktipur. Firm, but fair, her authority and sexual freedom seem unchallengeable, but for Omar, who resents her new marriage and is determined to get under her skin and manipulate her out of it. 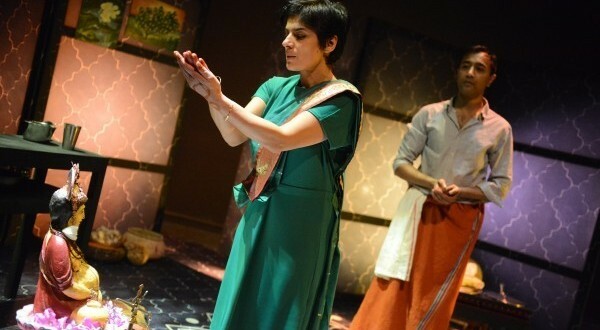 One finds oneself constantly transposing alternate genders on the characters and assessing the juxtaposition as the men bustle about the housework, preparing a celebratory meal – the rich smell of which pervades the theatre – and Aya strides confidently, dispatching tasks and making her wishes known, while gently attending to the worries and trifles of her husbands. It’s a powerful and clever genderflip – we are never quite comfortable with or sure of Aya as she manipulates her partners and cheerfully arranges her own marriage which, as Omar points out, for all the freedom and power of Shaktipur is still the exchange of her body for land. Even in the enlightened age, it seems, women cannot escape such judgement. The arrival of British lover Jerome (Phillip Edgerley) unsettles the husbands – as he dismissively refers to them – and he rapidly deconstructs their way of life; undermining Aya while ostensibly trying to protect her. There is little to mistake in the actions of a foreigner arriving to claim something for himself, throwing everything into disarray and promptly departing with chaos in his wake. Aya is determined that Western society treats women as equals while punishing them for it, and is set on pursuing the way of life that she has constructed, though some more subtle directing could have made her personal journey all the more painful. Played out on a stunning set, mindful and evocative of the rich culture it is portraying, The Husbands brims with knotty questions and boldly explores ingrained gender narratives held in both Western and Indian societies. Most troublingly, it asks whether women can ever really be free when bound and betrayed by their bodies; their revered and resented ability to reproduce.